Do you love grilled cheese sandwiches? We put a spicy twist on this classic recipe with Sriracha sauce! There is a burst of sweet crispy apples that compliments the ooey gooey cheese and spicy sauce. It’s awesome. 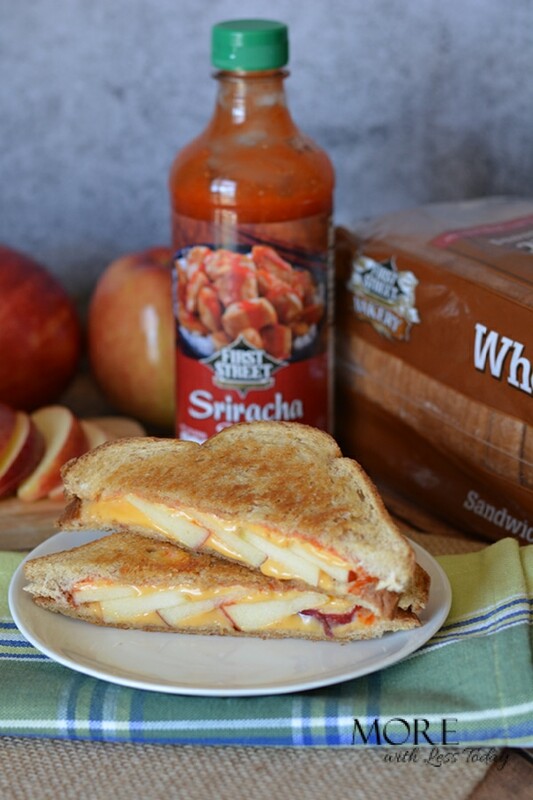 If you are a fan of Sriracha sauce and like things on the spicy side, this recipe brings grilled cheese to a whole new level! Once you try it, you’ll be thinking about serving it again to other grilled cheese lovers. It’s THAT good! You can cut it into fourths to serve as a fabulous appetizer. You can always leave off the Sriracha sauce if you make a separate version for the kiddos. 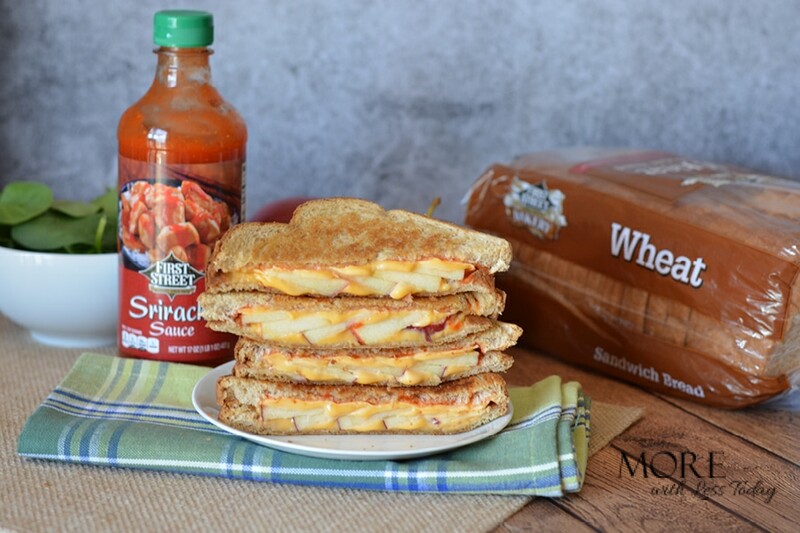 This Sriracha Grilled Cheese Sandwich recipe is a spicy twist on a classic and will surprise you! Butter one side of each slice of bread. Place one side, butter side down, into a frying pan. Add Sriracha sauce, top with a slice of American cheese. Add about 6 thin slices of apples to the cheese and top with another piece of cheese. Top sandwich with another slice of bread, butter side up. Heat on medium low four 3-4 minutes or until cheese begins to melt and bread begins to brown. Flip with a spatula turner and heat the other side 2-3 minutes or until golden brown. 1) Simply butter one side of the bread and place it butter side down in a frying pan. 2) Add the Sriracha sauce to taste and then top with a slice of American Cheese. 3) Add about 6 thin slices of apple (we used Jonagold but any crispy apple would work) and then top with another slice of cheese. 4) Top with another slice of bread, butter side up. 5) Heat on medium low for 3 – 4 minutes until the cheese begins to melt and the bread begins to turn golden- brown. 6) Flip over with a spatula and heat the other side until it also turns golden-brown. 7) Enjoy it while the sandwich is still warm! We partnered with Smart & Final to bring you this delicious recipe that features their private label products, First Street. They come with a “try it you’ll like it, or your money back” guarantee. 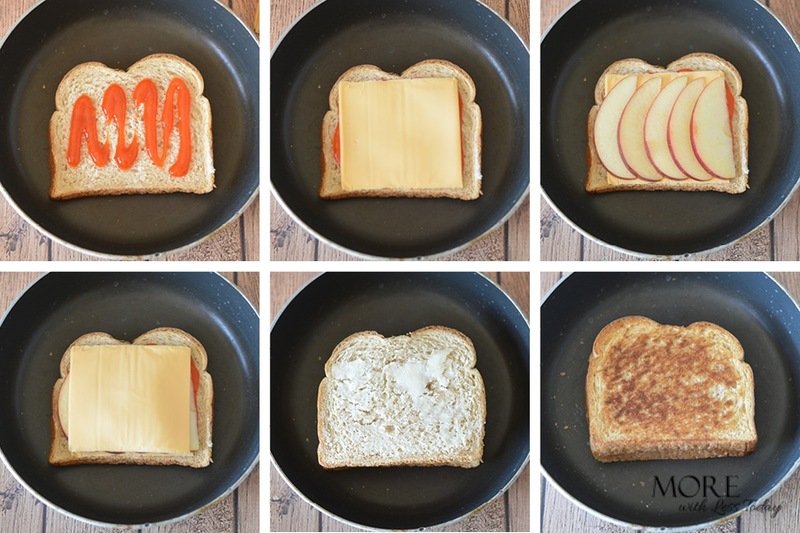 Do you have a favorite Grilled Cheese recipe to share? Now THAT is a grilled cheese sandwich! I’m always looking for delicious recipes for my lunches! Oh my! I would love to try this! What a great idea to put on that sandwich! I need something new for a grilled cheese this is perfect! I had no idea that there was a National Grilled Cheese day!! 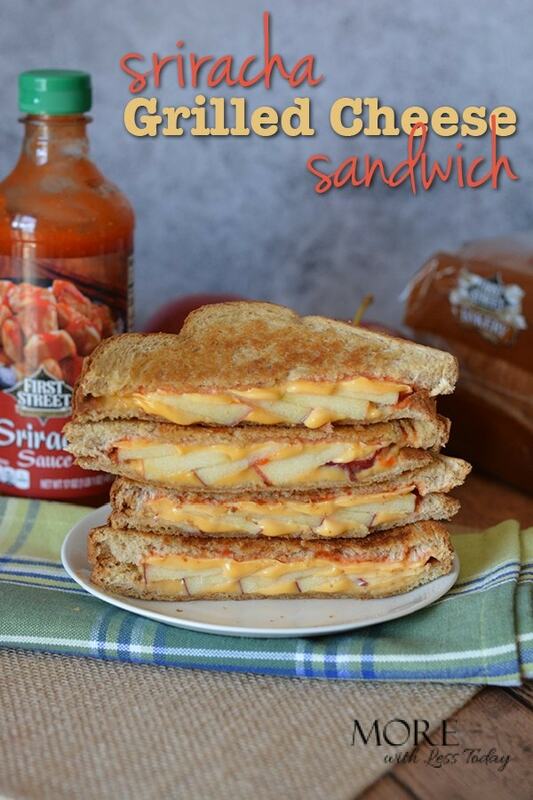 I love the addition of Sriracha to a grilled cheese I need to try this out! WOW! Apples, cheese and Sriracha together!? BRILLIANT! Looks SO GOOD! That sandwich looks amazing. I would love to make one of these. They look like they would taste so great. I never knew there was a national grilled cheese day either. That’s great! This looks amazing! I know what I will be making myself for lunch tomorrow! Why have I never thought of siracha on my grilled cheese! Perfection! Srircha Sauce makes everything taste awesome! I bet this grilled cheese sammie is amazing. I want to buy the stuff for making it when I go shopping this week. That is so yummy! I will make that tomorrow for breakfast. Thanks for sharing! Grill cheese is my favorite lunch idea. I have been getting more of a taste for spicy foods. I will have to try this delicious recipe this week. This looks so delicious and easy to make. I will have to make it for lunch tomorrow. I love the flavors of apple with cheese. I never thought to add sriracha though-sounds YUMMY! I am not a fan of Sriracha but my kids love it. I need to make this sandwich for them.